Last year, I was very impressed with Ava Dellaira's debut novel, Love Letters to the Dead. It was compelling, and I really enjoyed the epistolary storytelling style that she utilized to tell Laurel's story. The novel is coming out in paperback on September 29, and I'm pleased to be a part of the blog tour to celebrate its release. For this tour, each blogger was asked to write their own letter. (Note: You can also write your own letters, and share them here!) I chose to address my thoughts to William Shakespeare, which probably won't surprise those of you who know I'm a big fan of his work! I also get to share Ava's response, which is the letter below mine (and is really great). I’m admittedly nervous starting this letter, and it’s all because I fear that my own words won’t live up to the greatness of all the words you’ve left behind. Ever since I was a young girl, from the moment I first got hold of your tragedy Romeo & Juliet, I have considered myself a devoted fan of your work. There’s just something absolutely, undeniably magical in the way you string together words into phrases into sentences into complete written works. It’s certainly awe-inspiring in how perfectly your words can strike the heart, convey a feeling or paint a scene. It’s also quite intimidating, particularly to a girl like me who writes her own stories just for fun. How in the world did you do it? How did you come up with these timeless stories, stories that have inspired other tales in many mediums, stories that have become a part of the literature tackled in academics year after year? Did you know that you were going to leave such a significant mark on the world? Or were you, perhaps, merely writing for your own pleasure and amusement? Or to express all your own emotions in the most imaginative of ways? It would certainly be something if I could learn the secrets behind your drive to create or your actual creations. And I definitely wouldn’t mind getting a tidbit or two about some of my favorite works from you! Since that isn’t likely to be happening, I suppose I mostly just want to write to thank you. Your words were my solace and my encouragement during a difficult time in my life. They allowed me to escape my daily stresses and find myself lost within these imaginative, sometimes funny, sometimes sad worlds and experience someone else’s life for a time. Your words made me feel things as I read them; your words grabbed my heart and my soul and my thoughts so completely that I found myself wanting to immerse myself further in books and writing. It is you and your comedies and your tragedies, and later the sonnets, that got me interested in reading more classical literature. And it is your stories that continue to inspire, challenge and encourage me as I pursue my own stories to share with the world. Thank you so much for your wonderful letter to William Shakespeare! I loved reading about the ways in which he’s inspired you and your own writing. Even if William can’t respond (at least not in letter form), I imagine your ongoing relationship to his works will always feel like a conversation of sorts; one that you can continue throughout your life. I think that one of the gifts of great literature is that we can return to it again and again, deepening, renewing, rediscovering our relationship to it at different points in our lives. Romeo and Juliette was the first William Shakespeare play I fell in love with, too--though, admittedly, my gateway was the Baz Luhrmann film Romeo + Juliette, which was the first movie I saw without a parent. (I was in seventh grade, in a theater full of my friends, but I was so captivated I hardly knew anyone else was there. And oh, how I sobbed!) Afterwards, I pored over the book. As you so eloquently point out, it’s amazing to think of the timelessness of Shakespeare’s work, and of all of the people in the world who have formed a relationship to his words. With between 2 – 4 billion copies of his books in print, the numbers are almost mind-boggling! You share a love of him with people living in different parts of the world, people who speak different languages, people living at different moments in history; what an amazing connection. And yet, for each individual person who falls in love with his works the way that you have, they exist uniquely. So, thank you Alexa, for sharing your letter to Shakespeare with all of us. I wish you the best of luck with your writing, and I’m sure if he could, he would, too! a Rafflecopter giveaway Don't forget to visit these other lovely blogs on the tour! I would write to Walt Whitman or Eleanor Roosevelt. I would write a letter to my love letter to my friend who committed suicide a couple years ago. I really enjoy reading everyone's letters on the tour! I would write a letter to William Shakespeare! Thanks so much for the giveaway! I'd love to read this! I'd write to my grandmas. So cool that Ava responded to you! I would write to Heath Ledger and let him know that people loved him for him and not just his celebrity. Oh, how wonderful your letter was to Shakespeare! I'm definitely a fan of his works (though it's hard for me to understand them completely. Haha). I took a Shakespeare class last semester, and it was SO much fun! I think I would like to write a letter to my grandfather, who shaped so much of who I am today. Thank you for the giveaway! I love this book so much since I also write letter to dead people. A person I have not wrote but would like to has to be Joan Arc. 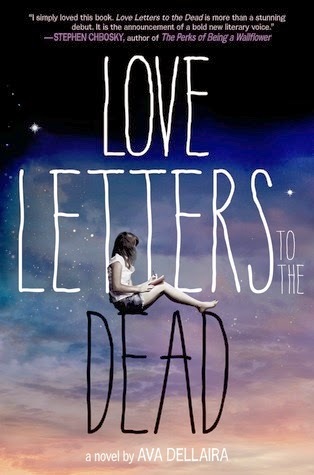 I absolutely adore the idea of having bloggers write their own "love letters to the dead" for a blog tour- it's so clever! It's funny, I never connected with Romeo and Juliet (despite loving some individual quotes from the books) but had better luck with some of his other plays (King Lear may or may not have been the only one I got through in its entirety...) For me, it's hard to think of a specific deceased figure I would write to, because I think it would heavily depend on the context of the letter that day- although I love the idea of writing to iconic female figures across a wide spectrum (from Queen Elizabeth I to Jackie O). Walt Disney, he has affected my life in so many ways. Great idea. I lacked such activities. I read books too. But such people as we every day becomes less and less. I don’t get tired of repeating that reading books is a very important point in the process of personal development. First, it broadens the mind, and secondly, makes people think and analyze. For those people who want to learn how to write an essay well, a prerequisite is to read a lot of books. Although now more and more students prefer to write essays using the essaymama reviews. I understand that it is very convenient to use such sites, but I ask you people - read more books.